I made this page to describe and semi talk about “Cherry Eye” in Cocker Spaniels. broke with a double cherry eye at about 14 weeks of age. Double Cherry eyes means the puppy has cherry eye in each eye. 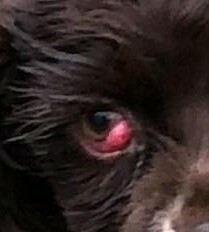 This is a up close view of a cherry eye on a 14 week old Cocker Spaniel puppy. Cherry eye is very common in certain breeds of dogs, one of the more common is the Cocker Spaniel than any other breeds. Cherry eyes are scary looking if you never seen them before and most owners freak out if their beloved pet gets one but really it’s not that huge of a deal. the eye lid has popped out and made visible. Because it looks pink/red we call it “Cherry Eye”. Cherry eye is mostly a cosmetic problem and there’s no reason to get worried if your dog gets a cherry eye. The dog’s eyesight is not in danger, there is usually no pain associated. the Cocker usually starts rubbing it. What causes cherry eyes? Usually it happens because the eyelid might be a little loose, sometimes it happens in rough play between siblings where a claw might pull against the eyelid. It also seems to happen during the time frame that they are cutting teeth. To help you understand cherry eyes a little better, it’s time for a little analogy. If you’re easily offended, you better stop reading right now, though! A cherry eye (flesh pops out from behind the eyelid that normally contains and conceals it) is very much like a breast popping out from behind a bra. It can happen for a number of reasons… the breast is too big for the bra, the bra is too loose or mis-positioned around the breast, or there is some brief unusual physical stress (imagine a mud wrestling match) that pops the breast out even though the size of the breast and the bra are perfect matches. So, if a breast pops out from behind a bra… what should be the first course of action? Rush to the plastic surgeon for breast reduction surgery? No, I don’t think so! The first thing to do is to use your fingers to either pull the bra over the breast again or push the breast back in to the bra… whichever works best. Then you wait and see if it stays in place after that. You also ask yourself some questions… why did this happen? Is my bra the wrong size? Or was I just doing some unusual physical thing that created just the right conditions to pop the breast out? It’s the same thing with cherry eyes in dogs. Don’t rush to the vet for cherry eye surgery until you’ve tried the simple fix first. Wash your hands, and then use your fingers to gently manipulate the cherry eye back under the eyelid where it belongs. You can try pushing the eyelid over the protruding flesh… of pushing the flesh under the eyelid… whatever works best for you. Make sure you and the dog are both calm before you start doing this. In most cases, you can massage a cherry eye back in to place. The question is… will it stay in place, or pop back out again? If it pops back out every time you massage it back in to place, or even if you can go a few days or weeks and then it just pops back out again… the dog is going to need some surgery to correct the problem. Either the eyelids are too loose, or the gland has become too large. One thing some vets try is prescribing eye drops to lower any swelling and inflammation in the gland. If the gland is inflamed, it won’t stay under… but if you can get that inflammation down, maybe it will. 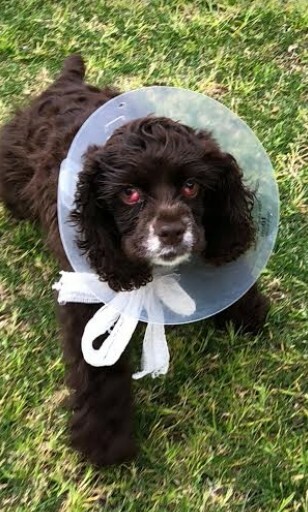 If the cherry eye occurred during rough play between two puppies, it most likely had nothing to do with the eyelid being too loose or the gland being too large… it just happened as a result of the rough play. Massage it back in place, and everything will be fine. The good news is that in a fairly large percentage of cherry eye cases, simply massaging it back in to place will solve the problem. The bad news is that some vets either don’t know this, or they don’t bother telling you! I hate to think about all the dogs that have had cherry eye surgery over the years that might not have needed it. There are two ways of removing a cherry eye. One way is to numb the eye and actually have it removed while they are put under of course but this way could cause dry eye because you are simply removing the gland that produces tear production. If it does cause dry eye you would have to put either eye drops or ointment in the eye for their rest of the dogs life. This is the cheaper route but dry eye is a possibility. The other way is to repair it by tucking it back in surgically. This has a cost associated to it that his much higher than the removal cost, but the possibility of dry eye is not there. The vet creates a pocket behind the eyelid where the tear gland can be tucked away, the gland is put inside the pocket, and the pocket is sutured closed. Another common technique is to anchor the gland in place with a stitch to the back of the eye socket. With either of these methods, the gland remains intact and can continue to produce tears. they say that it will not pop out again, for the most part they are right but in some cases I have seen they have popped out next to where the cherry eye popped out before. Some times prior to repair or removal you may be asked to put an ointment in the pups eye such as Vetroploycin HC to reduce inflammation so the puppy will have a better outcome with the removal or repair of the cherry eye. 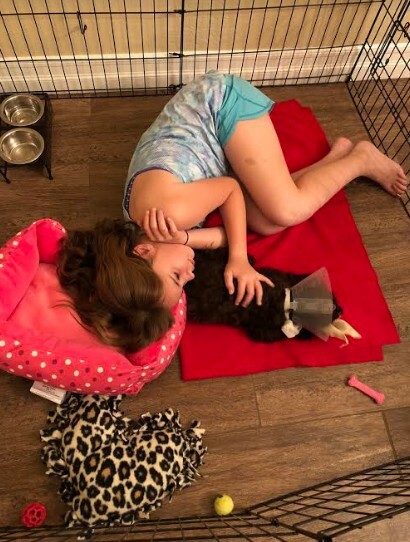 Also your puppy may go home an Elizabethan collar, E-Collar, Buster collars or pet cone,(sometimes humorously called a pet lamp-shade, pet radar dish, dog-saver, or cone of shame) is a protective medical device worn by an animal, usually a cat or dog. This is needed to prevent further damage to the eyes that may cause an ulcer or abrasions by rubbing or scratching of the eyes. Your vet can help you pick the right size for your pup, but in general, the base should fit around his neck the same way his collar does…With the proper sizing, your pet should be able to get his mouth to his food and water bowls even when he’s wearing the cone collar. I have seen cocker puppies first hand run, play and retrieve tennis balls with them on as well eat and drink. They work and it does prevent further damage to the eyes. Of course just because you have either removed it or had it tucked back in does not mean that the other eye will not pop a cherry eye. Usually, when one pops shortly after the other one will pop too. Sometimes people will wait a month or so to find out if the other one will pop to make sure the puppy is not put under multiple times. This is where my thoughts of it being cutting teeth related comes in to play. You do not have to go to a special surgeon to have this removal or repair done, there are many regular vets that are very experienced at cherry eyes.